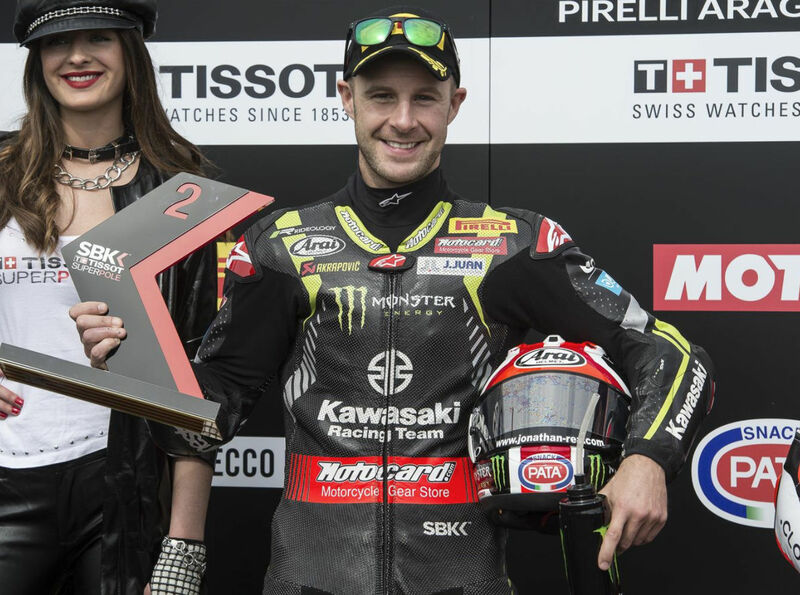 After a red flag forced a re-start in Race 1 Saturday, Jonathan Rea (Kawasaki) stormed to the win ahead of second place Chaz Davies (Ducati) and third place Xavi Fores (Ducati). Race 2 saw Davies switch things up by taking the win ahead of Rea in second place and Marco Melandri (Ducati) in third. Rea leaves Aragón with a 12-point lead in the championship. You will find full results to Race 1 here, and Race 2 here. For additional details and points, visit the official WSB site. Moto GP, WSB, all the same. DORNA runs both shows by the same philosophy. Which is bend the rules in favor of better racing. Which is what we all want right? Elbow to elbow right to the line. Both series have spent years in predictable states at one time or another. Lost count of how many years Moto GP existed with 4 bikes on the grid, same 4 guys every week end, sure if one of the 4 factory guys crashed you might get a stranger on the podium, but other wise it was same-ol same-ol. You think Ducati (or Suzuki) finally figured something out to run with Yamaha and Honda in Moto GP? Taking nothing away from their effort, but rule changes are the heavy hand there. As fans I think we want it both ways, Moto GP is supposed to be “prototype racing” kinda, sort of, but not entirely, if it was, few could play, only Yamaha and Honda have the resources to function in that arena. So bring in the rules and everyones talkin Moto GP at the water cooler. WSB suffers the same woes, and its racing is based on production motorcycles. Yes, in WSB Kawasaki is that much better than everyone else. Even with all the rules in place to slow them down, they are still the favorite to win the title this year. Its exciting to watch Kawasaki battle out of the last turn with “enter any other Mfg.”, but after the flag drops (regardless of who wins) and you think of the sanctions against Kawasaki, well its an ending best paired with a grain of salt. And to VLJ I say: I remember when AMA would draw crowds that even Moto GP would envy by todays standards. Times they are a changing, and we cant go back, but I am glad I was watching when all the different series had their glory years. Other than Daytona, which used to be a world-level event, even in its heyday AMA racing never had crowds like MotoGP sees nearly every weekend…. I wonder if it’s a reversal of fortune between MotoGP and WSB. In the past with MotoGP, one guy tended to dominate. That’s no longer true; the competition is fierce and highly entertaining. In WSB, it’s been the Rea show for a few years now. That seems to be changing a bit, but it’s boring compared to MotoGP. Also unfortunate that the best USA superbike riders can’t score rides (all due respect to Gagne and Jacobsen). [I]mercy post[/I]Man, just think back to the days of Doug Polen, Carl Fogarty, Aaron Slight, Scott Russell, John Kocinski, Troy Bayliss, Colin Edwards, et al, when WSB gave Grand Prix racing a run for its money, in terms of worldwide popularity.